A Bach in Oneroa is an original "Kiwi family bach" which was built in the 30s, but has all the mod cons of the future, while retaining the charm of the past. 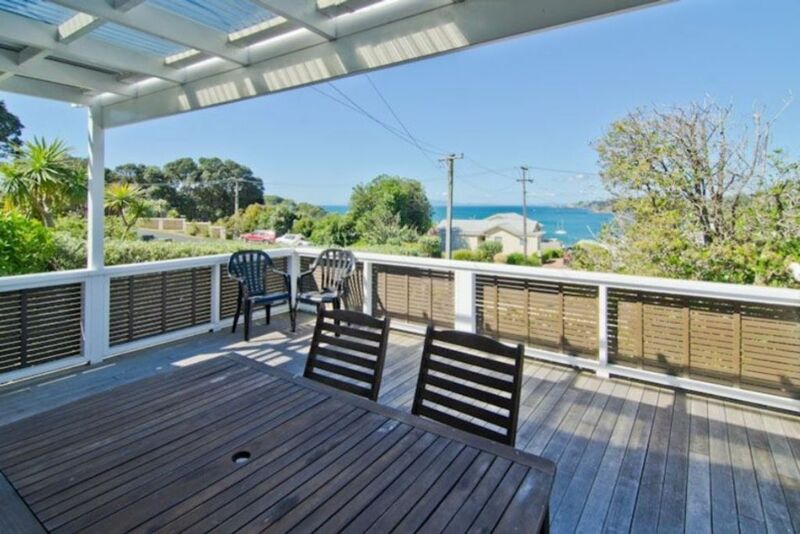 Nestled on a warm, sunny, sheltered site, it has privacy and is within walking distance of the Oneroa village shops, cafes, library, art galleries and entertainment. Buy your food locally and cook for yourself on the private patio off the kitchen dinning room area, or visit the many excellent Oneroa eateries (only 1 min walk down the road). The village also includes various Art Centres, a Four Square supprette, Fruit and Veg shop and 2 liquor stores. Mudbrick Vineyard, Cable Bay vineyard, Peninusula Estate and a mere 5 and 10 minute drive away. 3 nights min booking over long weekends. 7 nights min booking over Christmas New Year (20 Dec - 10 Jan). 1 night available with $150 surcharge. Please enquire. Lovely property, well set up for a group of 5 to stay. Comfortable and clean. Great location! Great little Bach close to everything! We loved our time in Waiheke and this little place made it even better. So close to the shops, ferry and the beach. Only thing - as the weather was so hot we needed to keep the windows open to get some fresh air - but the mosquitoes had other ideas!! Some ceiling fans in the bedrooms and living area would be a great asset to a house that really had everything. Thanks so much again for sharing your house with us. We had a wonderful stay here. We had a wonderful stay here. The bach was lovely and clean and in a wonderful location. Walking distance to everything. Lovely big deck to sit on and drink in the view. Thank you. Basic property but located within walking distance to everything you need! Awesome Bach!! So close to town!! Great for kids. Awesome Bach!! So close to town!! Great for kids. Comfy beds! Lovely view from the front deck and big backyard which the kids loved running around in. Would definitely recommend and stay again!